OnePlus 6T McLaren Edition may come with a 50W super flash charge - Playfuldroid! On December 11, at the G&G Creative Community in Shenzhen, China, OnePlus 6T McLaren Edition will be released and this smartphone will make a few changes to the regular OnePlus 6T. OnePlus will collaborate with popular car maker, McLaren, to release this smartphone. According to an information released by OnePlus on Weibo this morning, the company may be planning to use the 50W super flash charging technology used by OPPO R17 Pro. 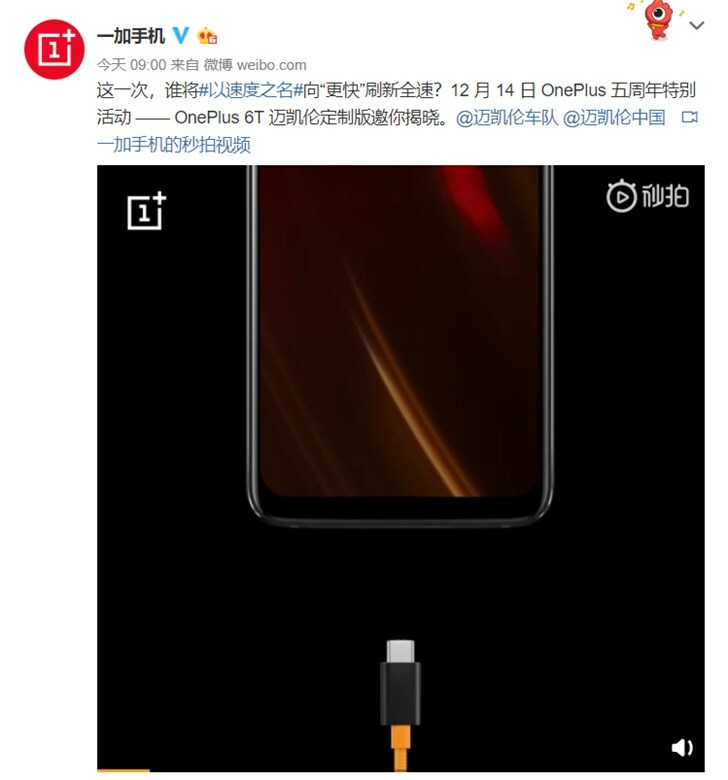 Although OnePlus’s post did not directly suggest that the special edition of the OP6T will use the 50W super flash charging, it did say that this phone will come with a better and faster-charging option. OPPO R17 Pro uses the 50W super flash charging technology which remains the fastest charging speed. The regular OnePlus 6T uses a 5W/4A 20W fast charging technology. Previously, OnePlus service had euphemistically admitted that DASH is “closely related” to VOOC, but for the sake of market propaganda, it started a new name and deliberately did not mention the relationship between the two. OnePlus 6T McLaren Edition has made a few design changes in order to distinguish it from the regular version. If the OnePlus 6T McLaren Edition is coming with a better and faster charging, it is very possible that it will be the 50W super flash charging. This is especially so because OnePlus and Oppo share the same parent company.